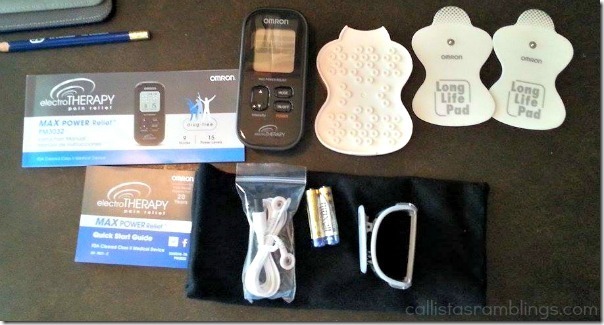 This review of the Omron Electrotherapy Tens Max Power Unit is by my mother and occasional contributor Barb. The unit was received to test out for review. All opinions are our own. TENS (Transcutaneous Electrical Nerve Stimulation) is a type of therapy for pain used by chiropractors and other doctors who specialize in pain. Gentle electrical pulses move through the skin to the nerves and block the pain message from getting to your brain. You can read more at the What is TENS page. 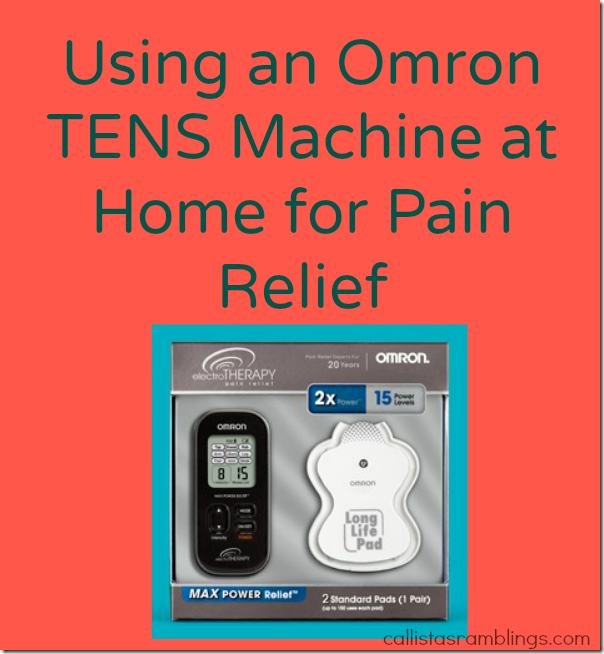 Tens units are helpful for those who work out and have post-workout pain as well as those who suffer from acute or chronic pain. I was happy to see that the unit comes with batteries. I was however a bit frustrated at having to unscrew the back to place the batteries as I searched out a screwdriver. Then later when I read the manual I found out I could have just used a coin. I loved the Quick Guide as I had it up and running in no time. However perhaps they should put a little note about reading manual for where not to place the pad. I put it on my most painful area which is low on my neck. Then while letting it run it’s 15 minute treatment, I read the manual and was worried as it said Do Not place on neck. Don’t worry I think it was fine as it was low on the back of my neck close to the shoulder. Although the unit goes from 1 to 15 because it’s a Max Power, the little pain meter picture went from 1 to 10. You are supposed to rate your pain from 0 No Pain to 10 Most Severe Pain. I ended up setting it to 9 and it felt great. It was intense enough and almost felt like getting a massage. My husband tried it on his lower back pain and found that if he went to 11 it felt like needle pricks, so 10 was a good setting for him. The setting does not correspond with your pain level. My pain was not most severe but level 9 or 10 was great for me. My husband has been getting TENS treatments at his Physio appointments the last several weeks and he said that this one feels different than the one they use. The difference is that the Omron runs through a series of tapping, kneading and rubbing pulses when set to a specific area. The lower back gives a series of high to low rate sensations followed by tapping, then higher intensity of kneading. Where as the one from Physio is set to one type of pulse. Therefore the Omron gives you a wider variety of settings to choose from. It came with a small set of pads and a large set was also sent. With proper care I believe they can last a long time. According to packaging they can be used up to 150 times. The manual explains how to properly use and care for them. I love the portability of the device. It’s no bigger than a flip phone. It comes with a belt clip but I would worry about it falling so won’t likely use the clip. It also has a carry bag. I can see myself bringing it along to camping trips, especially a week long summer camp. Care would have to be taken with storage as it shouldn’t be stored in a bathroom or any place with high humidity. Also with aging eye sight I liked the large readout. I believe that placement of the pads is important on how well the device works. There are good diagrams on placement but the area I want to do, neck/shoulders, needs proper placement. I may just ask my chiropractor about how best to place it. The sensation feels like rapid and slow tapping or kneading even though it’s really electrical pulses. It doesn’t hurt, however if set too high then it would feel uncomfortable such as the needle prick sensation my husband felt. I am looking forward to less pain and feel fortunate that I have had the opportunity to review this item. 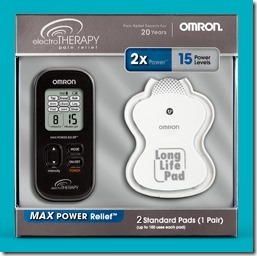 Omron has a few different TENS products but the Max Power Relief Unit has a retail price of $84.99 but is currently on sale on the website for $67.99. They currently only ship to the US. As mentioned previously it has 15 levels of intensity and 9 pre-set modes (6 pain and 3 massage). The box includes the unit, cords, two standard pad, pad holder, cloth carrying case, belt clip, 2 AAA batteries, instructions and quick start guide. Do you suffer from any regular pain?